Looking for safe and reputable POLi Casinos? Check this review out! POLi is a highly popular online payment method among casino players in New Zealand as it allows them to fund their casino accounts anonymously. Sadly, with the change in regulation Australian casinos are unable to process payments with POLi. Many trustworthy online casinos today support this banking solution and players can join them and use POLi to top up their accounts without a credit or debit card. Yet, they need an online banking account listed on the POLi website in order to complete their payments. One of the biggest advantages of this payment option is that it does not require registration nor it charges any fees on transactions. The service is provided by POLi Payments Pty Ltd, formerly known as Centricom, a company founded in 2006 and based in Melbourne, Australia. On the official website, the service is advertised as the leading real-time online debit payment system. POLi functions as a link between your online banking account and an online casino. At the moment, customers of 15 Australian and 7 New Zealand banks can use POLi to make their payments to gaming establishments. To use POLi, you don’t have to register with an account or to remember any new passwords. All you need is an online banking account at one of the New Zealand banks listed on the POLi website. While using this payment method, you will have to log in directly to your bank where the transaction is completed. POLi can be used on both desktop and mobile devices. Here you can watch a video posted by @Poli_Payments about their system and how to use it for payments in New Zealand. In which countries is it available? POLi is available mainly in Australia and New Zealand, but due to recent regulation, you won’t be able to make casino deposits in Australia using this method. POLi payments are safe and you are not required to share your personal or financial details with the casino of your choice. A wide range of reputable online casinos support POLi as a deposit method and the number of new ones increases on a regular basis. You don’t need a credit card or a special account to use POLi. Payments made via POLi are carried out in real-time, so you can have your funds available for further wagering instantly. 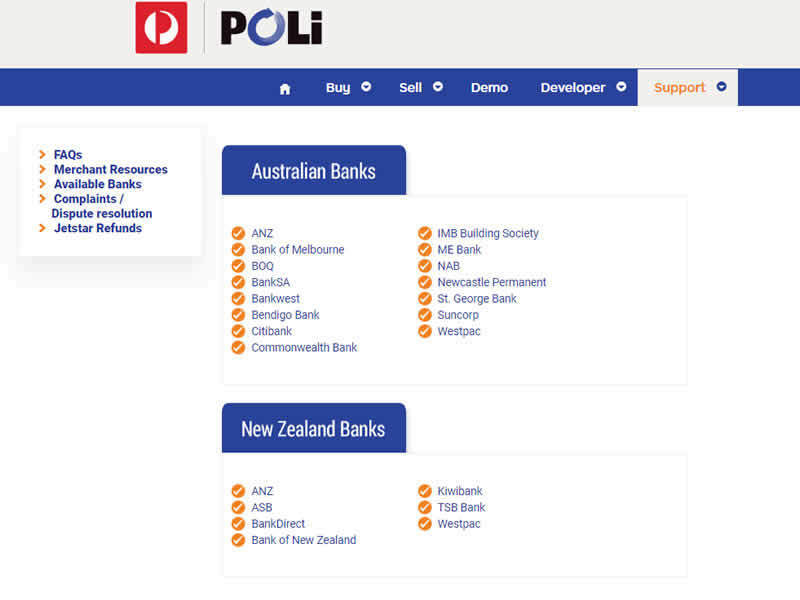 Australian and New Zealand players can use POLi to make deposits in their national currencies with no additional fees charged. With POLi, you can make payments wherever you are from your computer, smartphone or tablet as long as you have an online banking account. First of all, players cannot use POLi to withdraw winnings from their casino accounts and this is undoubtedly the biggest downside to this banking method. The service can be used only by Australian and New Zealand residents who must have online banking accounts with the listed banks. Once confirmed, deposits via POLi cannot be reversed by the bank like payments made via credit cards, for instance. Despite high security measures the service provider implements, some of the largest New Zealand banks have recommended that their customers should not use POLi “due to the serious security and fraud risks”. Go to the Cashier and under the Deposit tab choose POLi as a preferred payment method. When the POLi pop-up window appears, choose a sum you want to deposit and the bank you have an internet account with. Proceed to the login page of your online banking account and log in. Check the form with the deposit details carefully and confirm the payment. Unfortunately, you cannot make withdrawals via POLi. To clear funds from your casino account you have to opt for another banking method. POLi Payments won’t charge you any fee for using their services and since you will be depositing with it, the transaction will be instantaneous. If you are a New Zealand casino player, you should check this payment method. A big advantage is that all deposits at POLi Casinos are processed instantly, without the need to add your financial details – in case of deposits. Now if we are talking about withdrawals, you will have to choose an alternative casino banking option, because POLi only works for deposits. In this case, if you don’t choose anonymous methods such as Bitcoin Casinos, your financial information will be revealed. Sadly, due to recent regulation, Australian casino players won’t be able to keep using this method. If that’s your case, don’t worry. You can still opt for Neosurf vouchers in case you live in Australia. They work in a similar web and are popular within Aussie gamblers. No need to disclose your financial information. Works directly with your bank. No need to register. Only valid in Australia and New Zealand.